This private kite and surf Moon Tours charter aboard the very comfortable semi luxury 120-foot motor yacht, Carpe’ Diem is the ultimate in comfort exploration. This surfing experience in the Maldives is a unique opportunity to visit this beautiful part of the world in style on a Moon Tours private charter. Moon Tours Maldives Kite Surf charters have a generous fuel allowance for ultimate flexibility in the search of perfectly flat water lagoons and uncrowded waves. Motor Yacht Carpe Diem was hand built in 2008 completely out of wood in the Maldives. She’s 35 meters long motor safari yacht that has three decks, ten cabins, and can cater for up to 20 guests with two tenders to get in close to reefs, waves, and the islands or for fishing trips. Carpe Diem is also kitted out for diving and will be an optional extra for you. With 10 - 13 experienced crew you can rest assured that every detail is taken care of. The 10 guest cabins include one suite, one deluxe cabin, two double cabins, and six standard cabins. All Cabins have individually controlled AC, safety deposit boxes, and ensuite bathroom with shower and toilet. The power on board is 220 volts with UK three pin types. The Internet is available onboard. Although the Diem sleeps 20 guests you can rest assured that half the boat will be empty for your comfort and privacy. With a reccy coming up in 2017 this charter will be carefully thought out and planned based on the group's criteria with a guaranteed mix of lagoons and waves. The 115 feet luxury Motor Yacht Carpe Diem ten cabins over three decks sleeps up to 20 guests. With 13 specialist crew to take care of your holiday needs, locally built and owned, perfectly set up for kitesurf, surf, diving, and fishing charters. You will be accommodated in air-conditioned cabins with 70 x 60 centimeters windows (in the suite, deluxe, and high standard) or 20 x 15 centimeters portholes (in the standard), ensuite shower (with hot water) toilet, toiletries, towels, and beach towels. There is 60 feet dhoni enclosed with showers and toilet for surf trips and diving. DVD library and books library are also available. During the last decade, surfing in the Maldives has attracted many surfers from all over the world. The same swells hitting Indonesia deliver the goods to the Maldives except that the latitude is a little higher and the southeastern exposure has less energy. Moon Tours is the first operator to give you the opportunity of kiting this well-known paradise, with years of experience they know what surfers want from such a holiday and they know the Maldives will deliver. Trent Moon spent his childhood in the footsteps of modern day explorers, parents Ron and Viv Moon. He’s covered nearly every corner of remote outback Australia, worked in Africa as a guide in multiple countries and visited 11 in total. Since 2012, Trent and his soon to be wife, Stephanie, have combined their expertise, contacts, and experience together with their passion of surfing, kite surfing, stand up paddle boarding, scuba diving, 4 × 4 off-roading, camping, yacht charters, and African wildlife safari to bring you truly unique adventure travel experiences. Since 2012, Stephanie and Trent have combined their expertise, contacts, and experience together with their passion of surfing, kite surfing, stand up paddle boarding, scuba diving, 4×4 off-roading, camping, yacht charters, and African wildlife safari to bring you truly unique adventure travel experiences. Scattered across the equator in the middle of the Indian Ocean, the gem-like islands of the Maldives depict the rare vision of a tropical paradise. Palm fringed islands with pristine beaches, turquoise lagoons, crystal clear warm water, and stunning coral reefs with abundant varieties of marine life and hosting a massive variety of world-class waves that are now accessible to the traveling surfer. There are over 1,192 islands in the Maldives Republic, measuring 820 kilometers north to south and 120 kilometers east to west, the closest neighbors are India and Sri Lanka. People who have never been to the Maldives often have trouble comprehending that there is almost no land. It is sea with little pockets of coral dotted on top of an old volcanic mountain range. Only 202 of the islands are inhabited and there are no hills or rivers, almost no tides, the highest point above sea level is less than ten feet. In Maldives, you will find the island nations most famous waves in the North Male Atolls. The long breaks offer right and lefts for the beginner to intermediate kiters to the professional with waves ranging from one to three meters. For freeriding and freestyle picturesque lagoons and scattered sandbars, deserted islands will be the perfect backdrop for flat water kiting. There are three main surfing areas. The North and South Male Atoll, the surf season runs from April to October during the southwest monsoons. The bigger swells run from May to August with two to eight feet waves on offer all season. Central Atoll standard waves are long and clean with size varying between two and eight feet as well. During southern hemisphere winter (April to October), it’s pretty much never flat. Southern Atolls right at the southern point of the Maldives are best for surf from February to April and from September to November, there are always waves in the area but the winds become very strong at other times of the year. The most famous breaks are in North Male Atolls. These long points break offer rights and lefts, whether for low intermediates, intermediates, or for professional surfers, with waves ranging from one to three meters. For beginners, South Male Atoll is better suited. 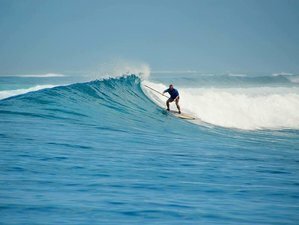 Surf spots can be accessed a number of ways such as by surf charter boat, point breaks straight off the resort, or by Dhoni transferring surfers from the resorts and camps. Not all surf breaks are accessible from land. A lot of surfers prefer surf charter boats to access the many different points in the north and South Male’ Atolls. On a boat, there are no constraints and surfers can choose among the most famous breaks. But try to ensure you surf Cokes, Jailbreaks (Himmafushi), Honky’s, Sultans, and Tucky Joes! They are amazing waves! Throughout the Atolls and island chains lay picturesque lagoons, from sandy quays to glassy water protected from ocean bumps by shallow reef. You are going to get those postcard type shots and memories you are looking for. On the boat, there are no constraints and this retreat is completely flexible. You can enjoy diving during this surf camp and even take PADI certified course for diving. 15 feet tender for additional support, fishing, snorkeling etc. Airport: Ibrahim Nasir International Airport Airport transfer included: Ibrahim Nasir International Airport No additional charges. You can request this in the next step. Moon Tours specialize in luxury adventure travel for small groups and private packages. They provide dedicated SUP surf, kite surf, 4x4 and wildlife safaris.